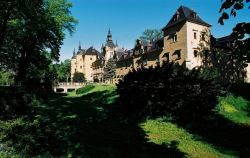 Secrets of Lower Silesia region, Romantic stay at palace - discover exciting Poland with us! A Neo-Renaissance residence having its roots in the 13th century, surrounded by an old park, finds itself among dense woods of the Forests of Lower Silesia, 12 km from Bolesławiec, in the village of Kliczków. The castle is favorably located near the international roads Wrocław - Berlin, Wrocław - Dresden, Szczecin – Prague in Lower Silesia region in southern Poland. The Castle is accessed via a three hundred meter lime avenue, which starts at the beginning of the village and then leads through a baroque Lions Gate to the bridge and Gate Tower. All the hotel rooms of different sizes are equipped with new but refined and stylized furniture. Along with a sophisticated and cosy arrangement of the interior, they offer comfort of real rest and calmness, adequately to such a unique place. Each of the rooms has an individual bathroom equipped according to modern standards. Studios are spacious rooms with a mezzanine containing the bedroom. A kitchenette and bathroom are adjacent to the main room. Like in the remaining rooms, their interiors distinguish with the cosy design in pastel colours with dark tones created by contemporary, but sophisticated and stylized furniture. • Hunting, mushroom picking, bonfires and outdoor events. In the Spring 2007 in Kliczków Castle start-up The Spa Center with full fitness and wellness facilities. Castle Guests will have opportunity to take advantage of a various fitness and wellness facilities - healing, beautifying and rejuvenating Their Body. All this facilities will be a perfect supplement of The Kliczków Castle attractions - the hikes, bicycle outings (bicycles can be rent in Castle), tennis and others sport offers of The Castle. Castle ensure also active holiday on fresh air in the Horse-Riding Center where guests can take horse-riding lessons and take a ride in a carriage. Currently also some of SPA facilities such as swimming pool, saunas and Jacuzzi are for Guests use. For full relax we suggest also massage, for instance: classic or relaxing. For massage please make an earlier reservation. - Castle visit with English or German speaking guide. - free of charge access to swimming pool, sauna, gym. - 50 % discount for bike rental, tennis courts and billiard table stay. Bolesławiec - a town in southwestern Poland with 41,117 inhabitants (2004). Situated in the Lower Silesian Voivodeship since 1999, Bolesławiec was previously in Jelenia Góra Voivodeship (1975-1998). It is the capital of Bolesławiec County. Bolesławiec in Lower Silesia was first mentioned in 1201 and took part in the battles against the Mongols in 1241. After that a renewed city with city walls was established. The city seal, still used today, was first used in 1316. 1346 Bolesławiec came under government by Imperial Bohemia. It was again heavily destroyed during the Hussites Wars in 1429. After that a double city wall was started in 1479. In 1898, the German government established the "Keramische Fachschule" (Ceramic Technical Training School) to foster development of the art. With the majority of burghers in 1522 becoming Protestant early on, Bolesławiec became an important center of the Reformation. The city town hall was rebuilt by the famous Wendel Roskopf in 1525 and at the same time construction of a canalization system was started. This was an unusual and difficult undertaking, that was finished in 1565 and it was the first canalization system in that part of Europe. For a long time Bolesławiec has been famous for its Bunzlauer pottery works. Pottery was an early trade and already in 1511 the Bolesławiec pottery guild is mentioned. This entire region has a history of pottery making dating back to the early 7th century. Early pieces from the 1700's and 1800's were used by farmers as storage pieces and had a chocolate colored glaze. At the end of the 19th century, the potters of Bolesławiec began to introduce new lines of pottery intended for use in the parlor. At the same time, they began to experiment with colored glazes, sponging techniques, and various decorations. Much of the pottery is of high-quality, hand-painted stoneware.